Today we came across a nice big rattlesnake on the trail just above where Layne did his endo (video link in side panel), telling us to leave him alone. Again I wish I had my camera. It goes into the pack tonight. After having seen the snake Layne missed a hill because he thought he saw a snake on the hill. It turned out to be a stick. I kept hearing things on the side of the trail thinking they were snakes but they were probably just lizards. We have a short ride on the road getting from Novell to the mountains. This sign is just before leaving the road and starting on the trail. 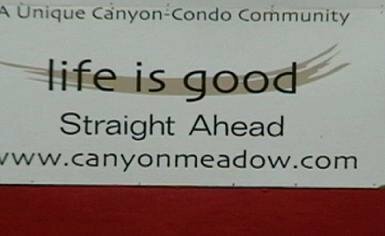 Life is good straight ahead! After a nice ride, looking back at the sign we think about how true it was. Two flats in two days, Arrrrrggggggghhhhhh! Thought for the day: After a close encounter with a rattlesnake, everything that rustles in the leaves is a rattler.